Easter brunch option at The Plantation House in Kapalua on April 21. Courtesy photo. If you’re looking to enjoy Easter with some great food and festivities, here are a few options around the island on Sunday, April 21. 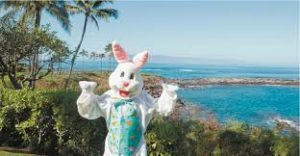 The Plantation House in Kapalua is hosting “Easter, Island Style” between 8 a.m. and 3 p.m. for a special Easter brunch buffet. Indulge in snow crab legs and poke at the seafood bar along with prime rib and Mahi at the carving station. Local classics include Hawaiian sweet bread french toast and vegetable fried rice. Guests can also create their own eggs to order at the omelette action station. The buffet is priced at $65 for adults and $27 for kids ages 6 to 12; children 5 and under are complimentary. 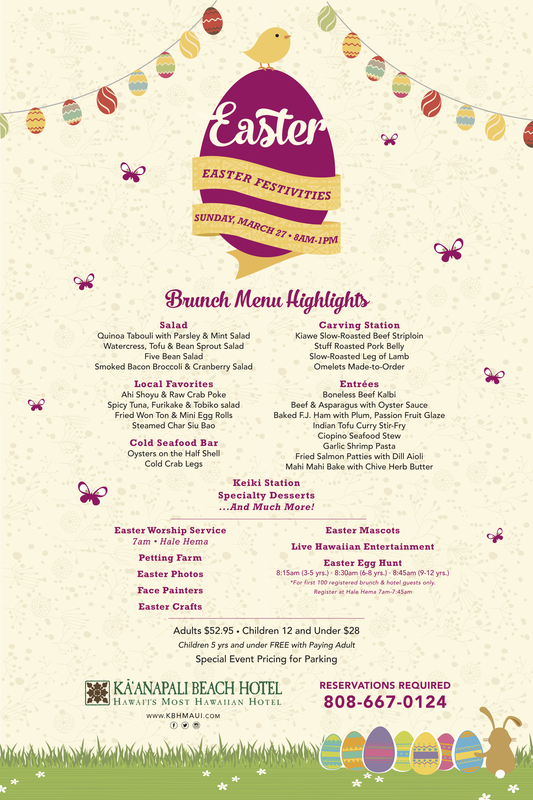 To view the full Easter Brunch menu, click here. Cane & Canoe, the signature restaurant at Montage Kapalua Bay, presents an Easter brunch spread from 10 a.m. to 1 p.m. It includes starters like Waipoli Greens salad, tropical fruits and smoked salmon display; a raw bar with chilled lobster tails and Ahi sashimi; a ham and prime rib carving station; breakfast options; desserts and keiki selections. It costs $75 for adults and $40 for children ages 5 to 12; children 4 and under are complimentary. Learn more about this and other family-friendly activities happening Easter weekend at Montage Kapalua Bay here. Easter brunch at Kāanapali Beach Hotel’s Tiki Terrace Restaurant includes more than a dozen specialty salads, cold seafood bar, carving station with beef, pork and lamb, local favorites, soups, pasta, desserts and a keiki station. The buffet is priced at $58 for adults and $26 for children; kids 5 and under eat free with a paying adult. Get more details on Tiki Terrace here. 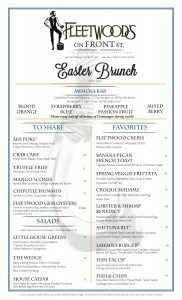 Fleetwood’s on Front Street in Lāhainā is offering a special menu on Easter Sunday. 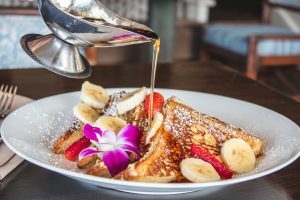 It includes a mimosa bar; starters to share like ahi poke, gem oysters and mango scones; salads and favorites that include crêpes, lobster and shrimp benedict, the Lāhainā burger and fish tacos. These items will be available between 11 a.m. and 2 p.m. Learn more about Fleetwood’s here. 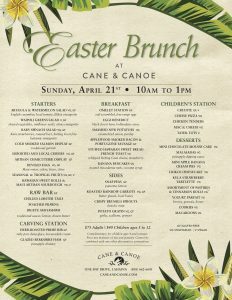 Cane & Canoe 2019 Easter brunch at Montage Kapalua Bay. Courtesy image. 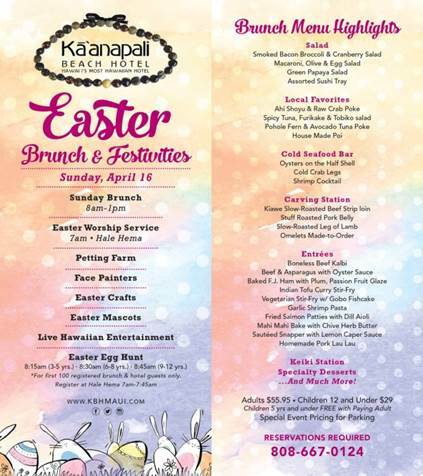 Kā‘anapali Beach Hotel Easter brunch menu. Courtesy image. 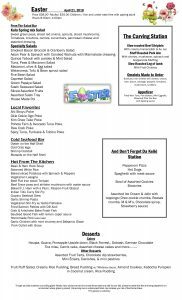 Fleetwood’s on Front Street Easter menu for 2019. Courtesy image. 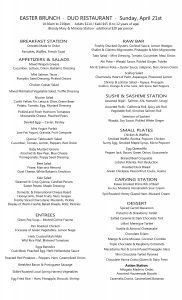 2019 Easter brunch menu at DUO in Wailea, at Four Seasons Resort Maui. Courtesy image. 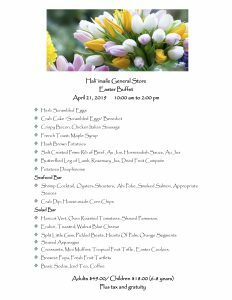 Hali‘imaile General Store Easter brunch menu for 2019. Courtesy image. Four Seasons Resort Maui restaurant DUO is showcasing an Easter brunch from 10:30 a.m. to 2 p.m. It features a breakfast station, range of appetizers, salads and entrées; raw bar and sushi/sashimi station; small plates, a carving station and dessert action station. Get more information about DUO here. Upcountry, Hali‘imaile General Store will host an Easter buffet from 10 a.m. to 2 p.m. Guests can enjoy breakfast options; a seafood bar with shrimp cocktail, ahi poke, oyster shooters and crab dip; prime rib and leg of lamb; a salad bar and desserts. The brunch costs $49 for adults and $18 for children between 6 and 8 years old. See the menu here. Maui Country Club members in Spreckelsville can enjoy a complimentary Easter egg hunt at 10:30 and DIY photo opportunity, along with an Easter buffet. It will include breakfast and lunch items, a selection of salads, fresh fruit, cheeses, pastries, a prime rib carving station, chilled seafood bar, omelettes and dessert crepes made-to-order. Seating times are 9 a.m., 11 a.m. and 1 p.m. The buffet costs $50 for adults, $20 for keiki ages 5 to 10 and complimentary for children 4 and younger. Walk-ins and reservations made after April 19 will cost $55 for adults and $22 for kids. Call (808) 877-7893 to make a reservation or learn about membership, and get details on the brunch menu and more here.